Powers/Abilities: Funtzel has two sets of eyes, a hippopotamus-like snout (but with both upper and lower teeth) claw-like pincers for hands, sturdy two-toed feet, and a short tail; he appeared to be a mammal, but any other anatomic variations are subject to speculation. He required a helmet to survive in space, but her skin was apparently durable enough the intense cold and vacuum. He wore a pair of (apparent) reading glasses on his lower set of eyes, presumably indicating some far-sightedness...which is more common with age, at least in humanity. 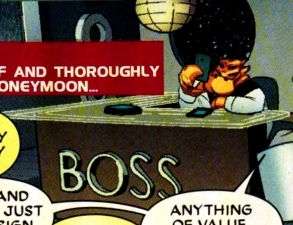 Unlike his much larger sister, Orksa, Funtzel was mostly inclined to discuss situations and delegate tasks to others. 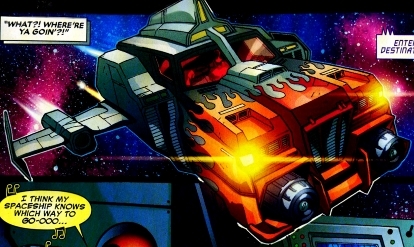 He had access to a number of ships...including one Deadpool thought was cool. (Deadpool IV#33 (fb) - BTS) - Funtzel Intergalactic employed Macho Gomez to help Obb with repossessions. (Deadpool IV#33 (fb) - BTS) - Macho married Funtzel's sister, Orksa. (Deadpool IV#33 (fb) - BTS) - Macho convinces Orksa that Funtzel Intergalactic should branch out into skip-traces, bond revocations, and...other stuff. (Deadpool IV#33 (fb) - BTS) - Kak, commander of the remaining Ongulian fleet, attempted to hire Macho Gomez, via Funtzel Intergalactic, to destroy Id, but was turned down. (Deadpool IV#33 (fb) - BTS) - Terra-Co hired Funtzel Intergalactic Towing & Recovery to recover their stolen drill. (Deadpool IV#33) - After Deadpool, believing he had slain Macho Gomez (see comments), flew Macho's ship into space and ran out of fuel, a distress signal was sent and received by Obb, who assumed Macho to be stuck (again) and brought the ship back to Funtzel Intergalactic. (Deadpool IV#33) - Upon arrival, Obb told Funtzel that Macho had run out of fuel again, and Funtzel wondered if Macho was wasted. After Obb responded, "Dunno, probably..." Deadpool interjected, claiming to have been the one who wasted Macho. Stunned that the powerful Macho had been slain, Funtzel pointed out that there would be consequences for doing that, after which Orksa attacked Deadpool; but Deadpool convinced Orksa to marry him instead, leading Funtzel to reluctantly welcome Deadpool to the business as his new step-brother. (Deadpool IV#33) - Deadpool met with Funtzel, who explained the business, reiterating several obvious points with pointed annoyance. Deadpool responded in the affirmative when Funtzel asked him if he intended to continue where Macho left off. (Deadpool IV#33) - Obb informed Funtzel he had obtained a location on Terra-Co's drill (the planet U-235), and that he was ready to take off right away. Deadpool insisted he wanted to go, and Funtzel agreed, despite Obb's objections that Deadpool didn't know the first thing about the business. Funtzel instructed Deadpool to keep a low profile as people took repossessions personally. (Deadpool IV#33 - BTS) - Based on Obb and Funtzel's reactions, Deadpool apparently practiced minimal stealth and instigated a direct and violent confrontation with the Exto Clan on U-235; Deadpool ultimately retrieved the drill. (Deadpool IV#33) - When Deadpool proudly delivered the drill to Funtzel and announced he had also launched a brilliant viral marketing campaign. Funtzel chided Deadpool that this wasn't what they did (presumably indicating his lack of discretion/delicacy, etc. ), and Deadpool responded, "It's what I do..." Obb requested a meeting with Funtzel, both appalled with Deadpool's approach to the problem and with Orksa's love for Deadpool. Funtzel worried that Deadpool might put them out of business, if he didn't get them killed first; but he was unsure of what to do, as Deadpool was family. Obb pointed out, "So was Macho. Until he died..." Funtzel worried that he'd be making Orksa a widow twice in the same month, but Obb insisted that he'd be doing Orksa a favor, as she could do so much better. As Obb continued, Funtzel realized that Obb really loved Orksa. Obb offered to make a few calls, to solve both their problems. (Deadpool IV#33) - Obb accepted Kak's previous offer, hoping that Deadpool would be killed in the process of trying to destroy the immensely powerful Id. (Deadpool IV#33) - After Kak explained to Deadpool the threat of their target, Id, Obb told Deadpool that he and Funtzel thought this was way too dangerous, if not impossible. Funtzel clarified that if Deadpool took the job, he took it on alone. Nonetheless, Deadpool accepted Kak's proposal. (Deadpool IV#34) - Funtzel found Deadpool trapped underneath a passed out and drooling Orksa. 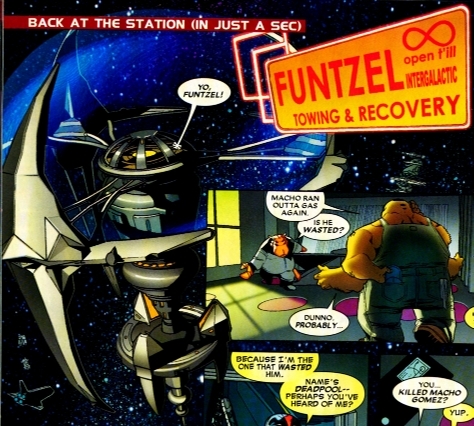 Deadpool explained what had happened and asked Funtzel to call Obb to bring his tow truck to lift Orksa off of him. (Deadpool IV#34 - BTS) - Funtzel called Obb, and he also sent word to Kak, who had been expecting Deadpool to speak in front of his troops. (Deadpool IV#34) - Funtzel watched as Obb used his tow ship to pulled Orska away. Funtzel attempted to assure Kak that Deadpool was the best, that inside of Deadpool's head hid an incredibly delicate and intricate mind. (Deadpool IV#35) - Obb met with Funtzel, telling him that Orksa hadn't heard from Deadpool, and that she had also stolen his keys. When Funtzel hypothesized that Deadpool might actually succeed in destroying Id, which would make Deadpool a hero, which would be worth a lot of money to the business; he continued that if Deadpool got himself killed, they would be no worse off than before, but if he succeeded, they'd be a lot better off. Most concerned about Orksa, Obb decided to try to make sure Deadpool perished, but told Funtzel he was going to help Deadpool. Realizing Orksa knew where Deadpool was, Obb asked to borrow Funtzel's ship, which he used to track his own ship. (Deadpool IV#35 - BTS) - Deadpool stopped Obb but took pity on him. Deadpool's plan succeeded in destroying Id, but Deadpool was forced to cut off all of his limbs to fit in the small escape rocket with Obb. (Deadpool IV#35) - Funtzel watched a viewscreen in shock as Id detonated. As Orksa towed the rocket into Funtzel Intergalactic, Funtzel excited greeted her, exclaiming Deadpool's success. Both Funtzel and Orksa were shocked to see Deadpool's bleeding, limbless body fall out of the rocket. When Orksa confronted Obb, Funtzel tried to calm her down, but Orksa ultimately embraced Obb, his risk-taking having made her realize she loved him. A few days later, Funtzel watched in silence as Deadpool gave Orksa and Obb his blessing, and then announced his departure and intent to steal one of Funtzel's ships (the cool one) before heading out. Comments: Created by Daniel Way, Carlo Barbieri, and Walden Wong. Why Funtzel is dwarven while his sister is gigantic is unexplained...but maybe that's the norm for their race...or maybe Orska is a mutant or some other variation from her race. 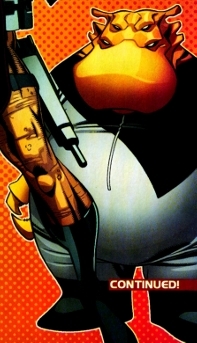 When Deadpool returned to Earth in Deadpool IV#36, the still-living Macho Gomez organized a group of people with a beef against Deadpool to "make that sumbitch pay fer one." Shortly thereafter, Macho was blown to pieces by a popcorn-missile weapon (read the story!) designed by Bob, Agent of Hydra, and fired by Weasel (Jack Hammer) in an effort to stop Deadpool. Deadpool ducked, and Macho was blown up instead. 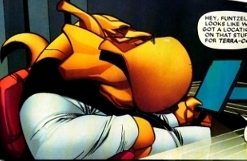 So, while he wasn't dead when Deadpool space-married Orksa, he did perish soon after. Funtzel Intergalactic is "open till infinity" (actually, it was the infinity symbol on their signs). The company business was towing and recovery of anything of value, such as repossession and salvage. They generally operated in a non-confrontational manner, re-possessing things without any struggle with the owner. The company is run by Funtzel, though Orksa is co-owner. Obb served as their field worker, as did Macho Gomez. Deadpool took over Macho Gomez's role for a time, but left the group after Id's destruction. It is unrevealed whether Axel and/or Jody were affiliated with Funtzel Intergalactic, or if they were just Orksa's lovers. When he left Funtzel Intergalactic, Deadpool said, "Funtzel? I'm stealing one of your cars, buddy. The cool one." The driver could program in a destination, and the ship would take it from there. Upon returning to Earth, Deadpool crashed the ship into a giant popcorn kernel created by Bob, Agent of Hydra, destroying both ship and kernel.